Battle of the Fandoms In Mini Form! One thing sci-fi fans love to do is tear into each other about which sci-fi is the greatest, and we don’t see a greater divide than the one between Star Trek and Star Wars fans. That said, there IS one divide regarding these two franchises that I want to talk about, and that’s in their starship miniatures games. Star Wars: X-Wing was created by Fantasy Flight Games and released at Gen Con in 2012. A year later (2013), WizKids licensed the rules (called Flightpath) to use for a game it had the rights for: Star Trek. The mechanic is rather simple. Each turn, you use special dials to determine your movements and keep them hidden, then take your movement and any additional actions, attack, and then the round ends to begin anew. The game itself is more complex than that, such as named ships, pilots, and additional loadouts for each ship. It’s also flexible enough to allow the creation of “missions,” basically set criteria to capture/destroy a target or ways to limit ship selection for each side. The game has potential overall, but the real question is: who did it better? Let’s take a look! Both games have their own Starter Kit, which retails at #39.99. Each kit including three ships and all the rules and materials needed to play. As it was created first, let’s start with Star Wars: X-Wing Miniatures (from now on, X-Wing). Before opening the box, we can see there are three ships available: two TIE fighters and the obligatory X-Wing. The plastic models are pre-painted and absolutely beautiful. The attention to detail is spot-on, and they are well-worth having solely because of that reason. Upon opening the box, we are given a slew of cardboard sheets to punch out for the various necessary tokens (including “objectives” like a senatorial shuttle), the distance rulers, the necessary stands for the ships, standard-sized cards for the ships, smaller cards for upgrades/damage, and six dice (three attack, three defense). Unlike most tabletop wargames, this game uses specialized movement, specifically with regards to arcs and distances, as well as special rules for ranges when attacking (+1 attack at close range, +1 defense at long range), so you NEED the special inserts to play the game properly. Shame they are made of cardboard, though. The range ruler for attacks is double sided to denote which side you are on; red for the Rebel Alliance, and green for the Empire. Useful in that attack phase and you have multiple rulers going around! The starter kit is everything needed for two players to go head to head, and is a step in the right direction should you wish to build a fleet for either of the two factions (Empire or Rebellion). The sample for one side of this conflict. One thing to note here is the difference in cards. We have full-size cards for the pilot/ship combo (with rules/stats/abilities), with smaller cards to denote damage/critical hits as well as upgrades. The cardboard ship base cards are double sided to save on cardboard; for example, one side for the X-Wing has Luke Skywalker, while the other has Biggs Darklighter. The Star Trek: Attack Wing (Attack Wing) set also includes three ships, namely the USS Enterprise-D (Next Generation), a Klingon Vorcha-class ship, and a Romulan D’deridex-class ship. Like X-Wing, we see a similar loadout in Attack Wing with regards to what’s inside: instructions, ship bases, cardboard inserts, and dice. A few of the differences are obvious. For example, the range ruler is set up to have phasers on one side and photon torpedoes on the other and, unlike X-Wing, already have the bonuses for ranges pre-marked. We also get a few different tokens, such as a Planet token. Additionally, we see one of the biggest mechanical differences: Captains and Crew (discussed later). Every card that the players will need to read often are full-sized cards, while the smaller cards are reserved solely for damage; this way, it is obvious to all sides what ship has which upgrades. Just an example. Full sized cards of X-Wing (left) and Attack Wing (right). X-Wing uses smaller cards for non-characters/ships, while Attack Wing uses the same size for almost everything. There are a few other changes here as well. We have Captain Portraits to place on the base of the ships so we know who is captaining a specific vessel (great for doubles; more on that later), and the double-sided cardboard base card has the named vessel (such as the USS Enterprise) and the generic version (a Federation Galaxy-class). As Attack Wing focuses more on capital ships, we see large numbers, so we actually start this game with more dice: ten dice, five of each attack/defense. The starter set for Attack Wing supports up to 3 players at the same time (as there are three different ships, all in the same category of power), and is a solid start for any of those three primary Factions. The game also supports mixed-Faction fleets (more on this later), so you can technically build a 100 point fleet out of what you have in this box alone. With regards to the ship molds, I’m not horribly impressed. While X-Wing has molds that make the old MicroMachines look like proper toys, Attack Wing gives us miniatures that look almost inferior to MicroMachines. The ships lack detail and are not horribly impressive; for game purposes, you’ll be buying this set for the necessary equipment and the cards, even though the ships are rather lackluster. I have later learned that the molds for the ships were from previous Star Trek games, which further increases the annoyance of an inferior product. The Enterprise pales in comparison here. In addition to the starter sets, each game line has a series of booster/expansion packs. These normally run around $15, but can go up based on what you get (such as the $40 larger ships in X-Wing). X-Wing has a slew of ships, each from different Factions. Some ships appear multiple times but are repainted for that specific Faction (such as the Y-Wing getting a repaint for the Scum & Villainy expansion). For this review, I got my hands on the HWK-290 as well as an E-Wing for the X-Wing side of things. The expansion pack gives us the ship, the stat cards for the pilot/ship combo, a number of upgrade cards, and any tokens necessary to play that ship. In the case of the HWK, we were given an upgrade card to denote that the named version of the ship is the Moldy Crow, and the advantage of having the name is listed on the card. If a booster pack requires some sort of new rule (in the case of the HWK, the “title” rules), an additional card is included to explain how that rule would work. The main focus of these expansions are the ships, hands down. Like the starter set, we get amazing details for the ships, and they are absolutely gorgeous with regards to the details. Another fun part of these ships, at least in the smaller packs: the ships are relatively close to scale. Granted, it goes out the window in later expansions (especially with the “big” ships like the YT-1300 or the Firespray), but it’s still pretty cool the attention of detail they provided with each model. Each ship is also clearly distinct from each other in some way, usually by color. Yes, you can purchase multiples of the EXACT same ship, but that’s what the cardboard base cards are for, of which you get at least one, but more often two (often 4 different pilots per ship, each with a different cost). As money is not something I have copious amounts of, I only picked up two of the smaller ships at the local game shop and did NOT get to pick up the expansions for Scum and Villainy (a new Faction with it’s own starter set) nor did I get the larger ships (again, $40 price tag, but they look GREAT). The beginning of my meager Rebel fleet. Note that I am not talking about the Star Wars: Armada series here, which is a game focused on capital ships (with crazy price tags but stellar designs). My Attack Wing purchases are a bit more vast, and that is solely because of a killer sale and freebies netted at my FLGS. Each Attack Wing booster I’ve opened includes at least two Captains, two crew members, two upgrades, some form of new rules (shuttles get shuttle rules, timed weapons get an explanation, new factions are explained, Admirals are introduced, etc), the necessary tokens (including objectives), and usually a Mission card (a mission involving that ship and rules for building fleets on both sides). The ships are a mixed bag, to be honest. Some of them are well detailed, such as the Bird of Prey I picked up. Others are pretty bland and are just a different paint scheme (but same faction) as a previous ship. In one example, I picked up an additional Klingon Vorcha-class, and the paint scheme was drastically different. Booster on the left, Starter Set on the right. As Star Trek often used the same ship/props for multiple sides, we see multiple versions of the same ship, such as a B7 Cruiser for both Romulan and Klingon Factions. In this case, the paint is different, but they did a repaint of the Gr’Oth that matches the Algernon if memory serves correctly. As stated before, some expansions are repaints, but are otherwise the EXACT SAME as the previous one. For example, the USS Defiant was released in 2013 in Wave 1. The same design was used (with one minor change) in Wave 9 for a Mirror Dimension version (ISS Defiant), in Wave 23 as the USS Valiant, and then again in Wave 28 as the USS Defiant with a metallic paint job (sans Starfleet Logo found on the original). The newest Defiant has identical cards to the old one, so it really just is the same thing with new paint; the other two had different cards, even if it’s the same mold. Photo shows the ISS and USS Defiant, but my cards for the two USS versions are identical. Nothing changed. The mold for the ISS is an exact match for all of the others of the type outside of subtle changes. We see the same with some Romulan and Klingon ships, such as a translucent coloration used for certain cloak-capable vessels. It’s odd, and it can be confusing as there’s no real way to tell the difference between a Klingon vessel and a Romulan vessel of the same type, or a Prime Universe and a Mirror Universe counterpart outside of the little card at the bottom to help denote the faction (like above; if I had my original version of the Defiant or even the Valiant, you would be hard pressed to tell them apart).. While I did buy a rather large collection of ships (i.e. freebies), I didn’t go TOO far here and pick up the massive ships that run $70+ (like DS9 or the Borg Cube). Not sure if I will, but I’ve heard these large items have great detail involved. The two games function almost identically, so where are the differences? The first difference is in quality of the ships, as well as originality. Star Wars as a franchise does have a wide selection of ships used on both sides of the Galactic Civil War (as well as those used by nefarious criminals), and as the game is designed around individual starfighters, we see a plethora of different vehicles making the rounds here. Star Trek doesn’t have that same ability, as again, it was mostly capital ships and props were often reused from episode to episode, which does detract from the available pool. Thankfully the larger number of Factions mean we see a large number of different ships, but we do see duplicate ships across multiple factions. There’s also a price-point concern that I have with the game. Each ship runs around $15 normally, and in X-Wing, you know you are getting a highly-detailed fighter. In Attack Wing, that $15 might net you a tiny Constitution-class ship or a massive Negh’Var warship. Not the same in plastic or cards. The larger ships had more cards and more SHIP for the same price. Rules-wise, things look pretty cut-and-dry at first, but then the two games go in opposite directions. When you get a ship in X-Wing, you get 2-4 pilots for each ship, and each pilot is named. You sadly can’t mix-and-match pilots; if you get Luke Skywalker, he will only pilot an X-Wing, while Kyle Katarn will only pilot the HWK-290. A comparison. The only card you need for X-Wing, while you need a minimum of two for Attack Wing. X-Wing also has clear rules on Factions. When you build your fleet, all ships must be from the same Faction, meaning you cannot mix Imperial ships with Rebellion ships, or Rebellion ships with the Scum and Villainy faction. The same is true for your upgrades; you cannot put an Imperial upgrade on a Rebel ship. I found this approach rather odd, as all sides in the Galactic Civil War were always stealing from each other, setting each other up, and the criminal element always mixed and match. Some pilots also use multiple ships and have the same ability (like Luke piloting a snowspeeder with the same skill as an X-wing). It’s a shame I won’t be able to have Luke piloting the Millennium Falcon, but it is what it is. The closest we get in X-Wing is being allowed to use the ship from one faction as long as you have a card for it from another Faction (like Y-Wings and Z-95 Headhunters which are used by both the Rebellion and the Scum and Villainy Factions). When building your fleet, you get your set points, and each Pilot/Ship combo has a set cost, followed by the set costs for upgrades. Each ship has a set number of upgrades of different types (such as weapon systems), and you cannot add more upgrades of that type without some sort of special effect. Attack Wing, on the other hand, throws this right out the window. Right out of the gate, you may have a multi-Faction fleet. This means, as long as you have enough points, you can take the Enterprise (Federation) and a Borg Cube (Borg) against the ISS Avenger (Mirror Universe) and a Negh’Var warship (Klingon) without breaking any of the rules. Additionally, the ships are also broken down a bit more, namely as a named vessel versus the generic (Enterprise or Galaxy-Class); you can have as many ships of the same type as you want, as long as they don’t all share a name (so you can take three USS Defiant boosters and field them all , one as the Defiant, the others as generic Defiant-class ships). To further expand on this, you can choose who you want to Captain the vessel, who you want as Crew, and what other upgrades you want to add (weapon or otherwise). Each of these has a point cost, which means a single ship can be the majority of your Fleet. Not only can you have a mixed-fleet, but you can also mix factions on the ship itself. Want to have Kirk captaining a Borg ship staffed by Klingons? It might not look good mechanically, but you can do it! Want Seven of Nine on a Mirror Universe Enterprise captained by Prime Universe Riker? Have at it! You can also mix and match upgrades as well; as long as the card doesn’t state otherwise (some upgrades only work on specific ships), you can put any captain, crew, weapon, or upgrade on any other ship you want. There is a minor point charge for this (1 point per upgrade), but in the grand scheme of 100+ point games (and a number of ships averaging in the mid 20s and 30s), a single point for each upgrade that doesn’t match is a drop in the bucket. The winner of the 2016 World Tournament. Klingons on a Federation Vessel with Romulan Weapons apparently win the game! This freedom is also one of the biggest disadvantages of the game: balance. X-Wing is thoroughly playstested and has a slow production schedule . As of this writing, X-Wing currently has 34 expansion packs spanning nine waves. 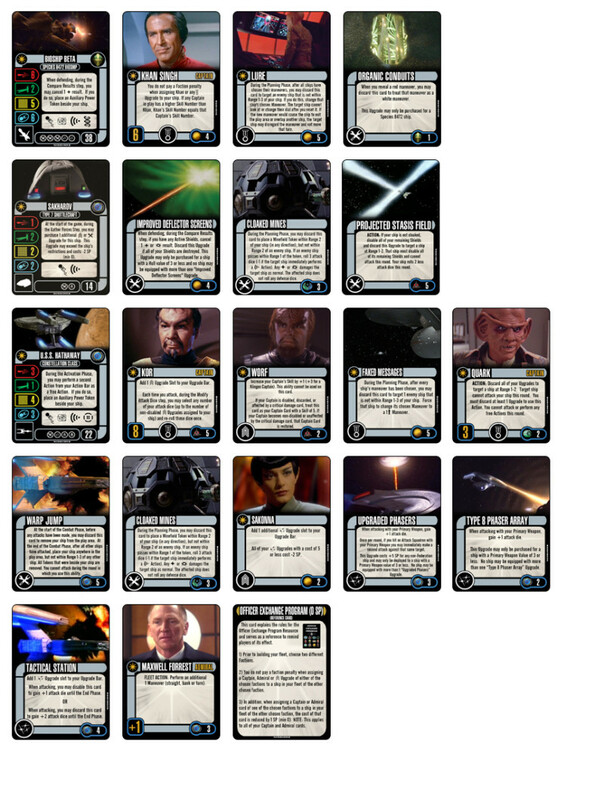 Attack Wing, on the other hand has 28 waves with 98 ships, nine of which are repaints, and there are a number of ships and captains that were only available at special events as boosters of prizes (like the Assimilation Target Prime ship or the Khan card). This production schedule and the ability to mix and match has raised some concerns with balance issues to the game. Some say that the freedom actually makes the game easily breakable, especially with making a juggernaut of a main ship for your fleet, while others say that things balance out in the end and some Factions are just inherently weaker than the others. Both games are solid, honestly. I think X-Wing has the better molds and selection for the ships, while I feel the freedom of Attack Wing is hard to ignore. It really does boil down to “play the game you love.” I’m a huge Star Wars fan, especially of the starships, so I’ll probably be loving X-Wing quite a bit, but I know a few Trekkies that love the mixing and matching of Attack Wing and will play that…while stating X-Wing is the superior game. In the end, I’m calling it a draw. Near identical rules already set an almost-even playing field, but ship quality vs mechanical flexibility is a tough thing to really compare to each other. I will say that if you are a fan of Star Wars or Star Trek, you will find the respective game enjoyable and the miniatures to be of interest. If you enjoy playing the RPG for either of these games, the minis make great tools for mapping (although the freighters for X-Wing are a bit tougher to use to scale). In fact, it was why I picked up the Star Trek ships in the first place. Both games are still in production as of this time. Starter packs retail at $40, and expansions retail around $15 for a single standard vessel and climb into the $40-$100 range for other various expansions depending on size. Fate/Zero – Manga Outshining Anime?